Home The Adventure Argentina You Know When You’ve Been Tango’d! 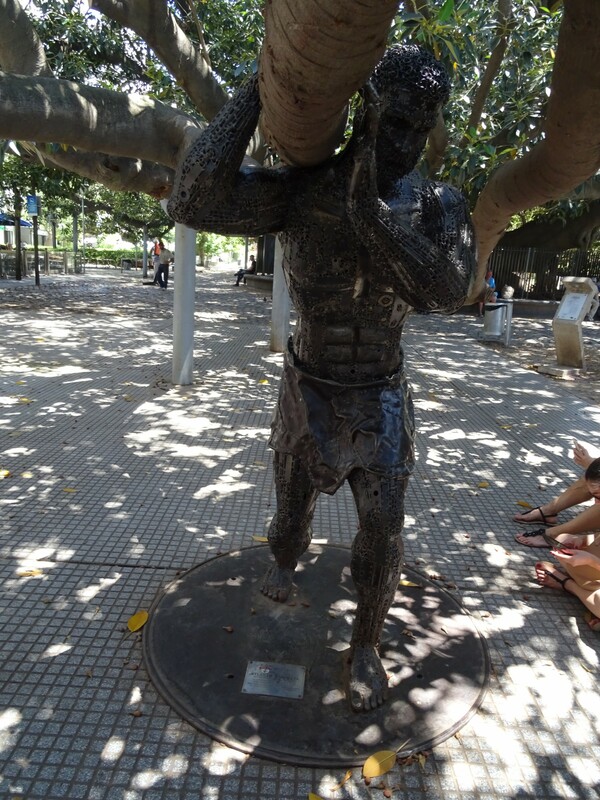 Being in Buenos Aires did not begin well. I arrived early afternoon, and spent the rest of the afternoon searching for an ATM that would actually accept my card. Two i found weere out of service, two said I had exceeded my withdrawal limit (not what I wanted to see), three just declined my card outright and the rest were simply closed. It took me over three hours to find one that worked, a by this point very hungry self trekking almost to Plaza Mayo, to the giant Banco Patagonia – my saviour. It’s a good job I did it then, too, as it’s closed all weekend. Thankfully, the rest of my time in Buenos Aires was better. Plaza de Mayo, and the giant Banco Patagonia. It played an important role in my life! I sacked off the rest of the day to calm my seething thoughts, and promptly met a Swedish couple who I spent the evening drinking and eating falafels with on the rooftop terrace at the hostel. Looking out over the city they gave me some advice on places to go, and since they were leaving the next day the gave me their SUBE card too (for use on buses and the subway). I vowed I would do the same when I left. I still currently have it. Ooops. View from the hostel terrace. Not bad. My room on this first night was at the front of the hostel – the tradeoff being a good view for traffic noise. That would have been fine normally, but at the time I was there, there was an odd machine set into a shipping crate just outside. I’m not entirely sure what it was for (actually, I have no idea whatsoever) but the force at which it spat air out meant it sounded like an aeroplane was taking off. All the time. I changed rooms after this. 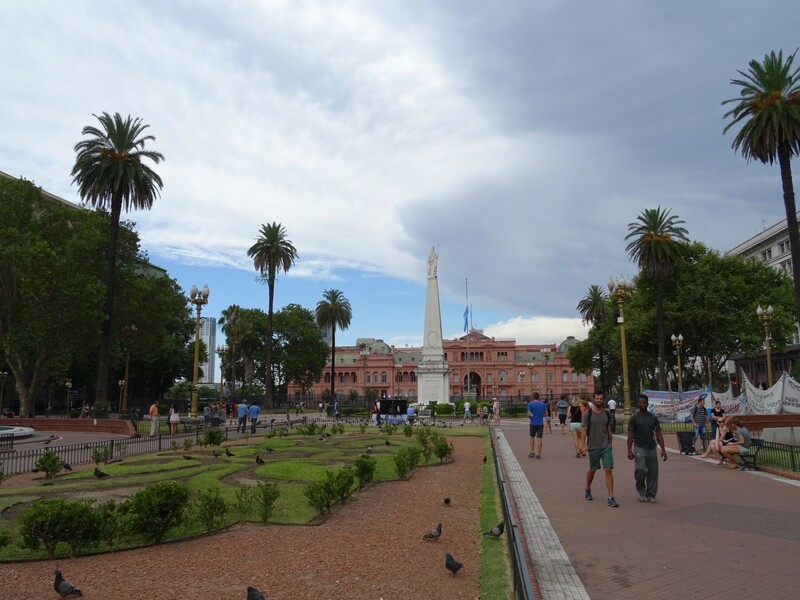 Plaza de Mayo and the pink building. That seems to be it’s official name. The next morning I crawled out of bed just in time for breakfast at the hostel. Whilst I personally felt this was pretty bad (particularly as breakfast lasted till 11 o’clock), this seemed to be the norm. The difference being that many others were just getting back into the hostel after a night out, and eating before bed. I flailed against this tardiness my whole time in Buenos Aires, an all encompassing vice that has claimed me before, but to no avail. The Argentine propensity for ridiculously late dinner and later nights consumed my will, the necessity for sociability gnawing away, and I limply accepted defeat. And sleep. Evita’s a pretty big figure here. I did get some stuff done though. 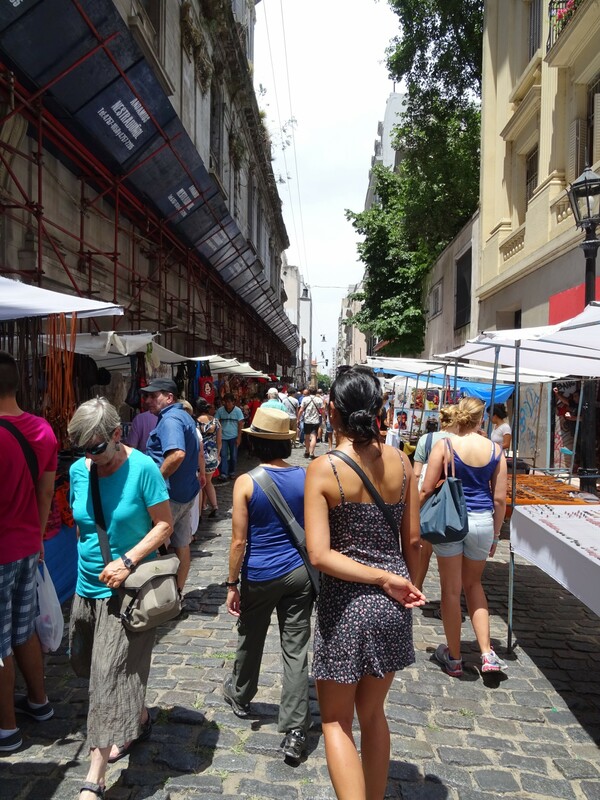 I headed off for a walking tour, in the afternoon, of a few of the historic points in central Buenos Aires. To be fair, I had seen most of them on my journey to find a working ATM, but it’s always nice to get a bit of the history of these things. 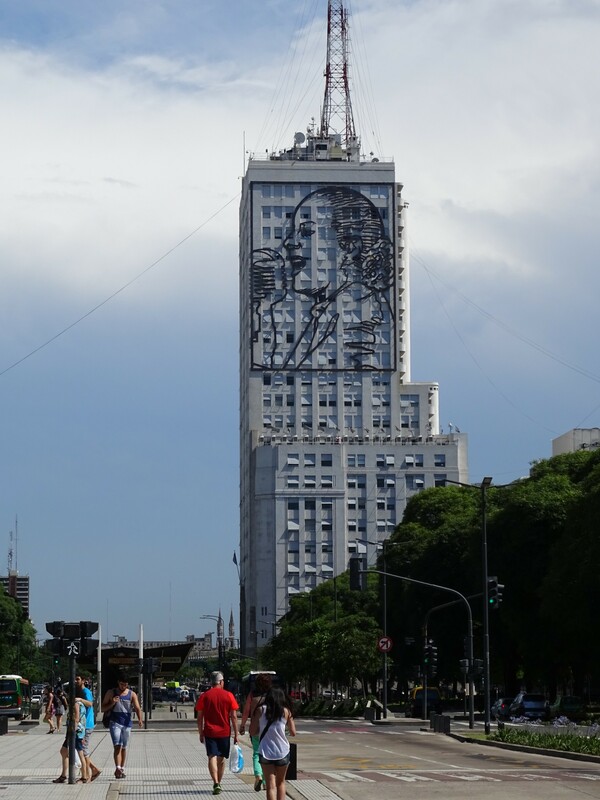 I witnessed a very different viewpoint on the recent elections here, the guide being very sceptical of the likelihood of Macri’s government doing anything good – not that her was an evangelical Fernandes supporter either. A couple of girls I met in the hostel (so referred to as I only remember the name of one of them), and I visited the markets in San Telmo the next day. Set in one massively long street, originally, I believe this was a traditional market, but it’s obviously geared more in the direction of tourists now. Nevertheless, there is some really cool stuff here, from antique cameras (absolutely everywhere!) to weird musical instruments to matchstick men dancing a tango around a clockface. This street goes on a long way. 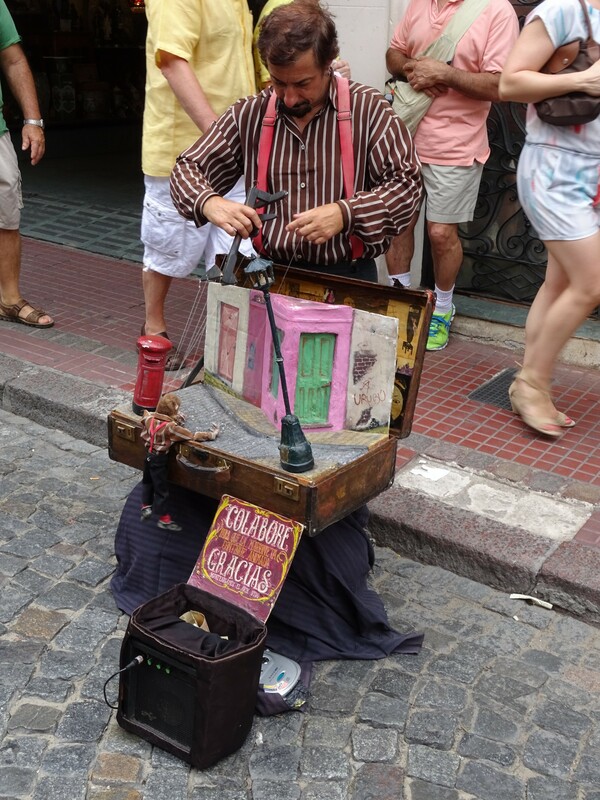 There’s also dozens of street performers throughout the day. Some of them playing tango music with (what is apparently definitely not) an accordion, some noiselessly pretending to sing and play guitar, and others yet telling stories with puppets. It’s entertaining despite the obvious tourist influence, and we spent most of the day here just checking everything out. This was actually pretty entertaining. 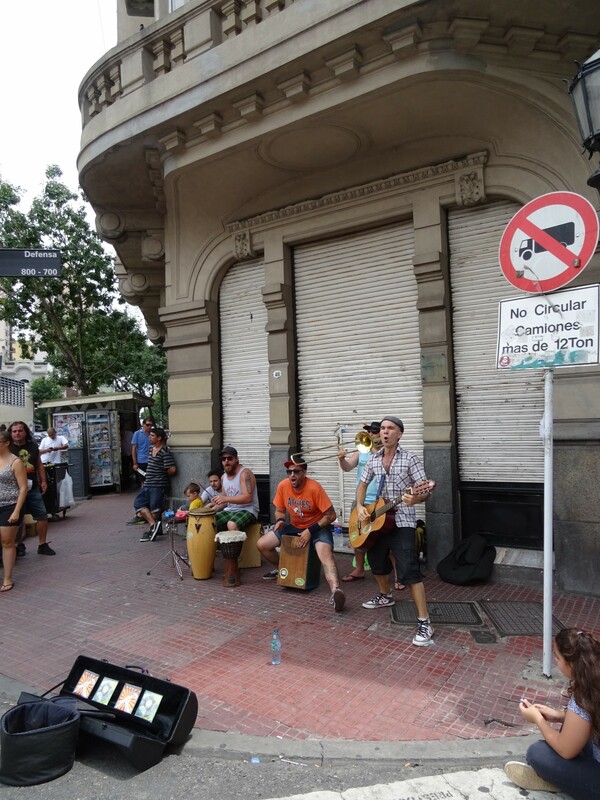 It had been recommended to me that I should see the drumming in Buenos Aires, but I hadn’t quite realised it was such a professional outfit. I’d thought it’d be a gathering on the street or something, but it’s actually set up like a proper gig – the only street gathering being that of the long queue from the entrance. Upon entering, I seized upon the opportunity to to grab a beer and thereby casually (with utmost levels of cool) begin looking for the one guy I met in the hostel who said he was also going. I was unsuccessful, but after walking past them about three times, I introduced myself to a girl i recognised from the walking tour and her friend, as awkwardly as possible of course. Luckily, she recognised me too, and didn’t look at as if I was too much of a pariah. Phew. The guy on the right was actually miming everything, I swear! La Bomba del Tiempo itself was really awesome, the rhythmic drumming embedding itself in everybody’s heads as the evening wore on. About half way through, a singer came on with the band and mixed things up with a few songs, one apparently about loving weed. I should have guessed that “weed” translates to the Spanish of “flower” here. As people got more drunk (and more stoned, I could smell) the dancing and cheer spread out, and everyone was having a great time. Then it stopped. 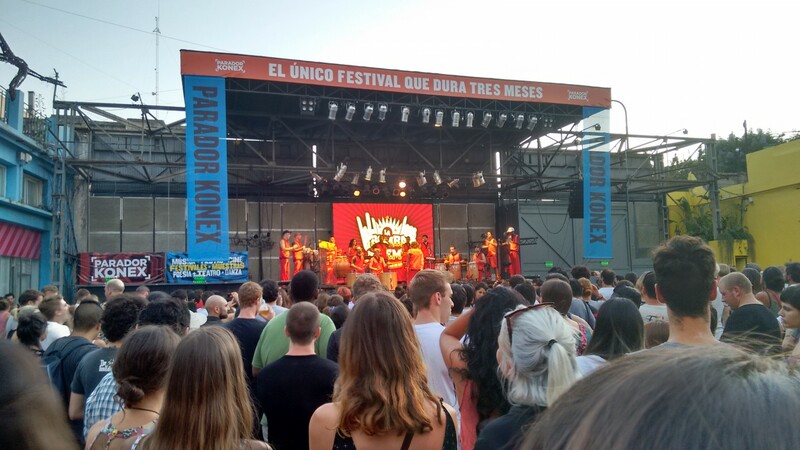 In a city where nights out don’t start till 3AM, La Bomba was over by half past 10. This is before it got dark and my phone became unable to take a half decent picture. Actually managing to get up in time the next morning, TJ and I were even on time for the meet up for the tour of La Boca. 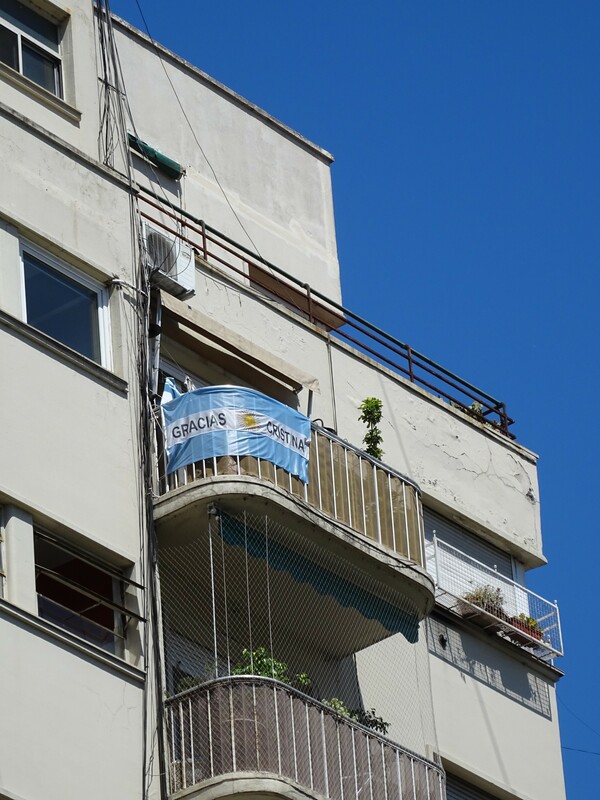 This is one of the poorer areas of Buenos Aires, but one with a lot of fame. After a lot of faf, the (rather intimidatingly large, for the driver) group finally all got on the bus. 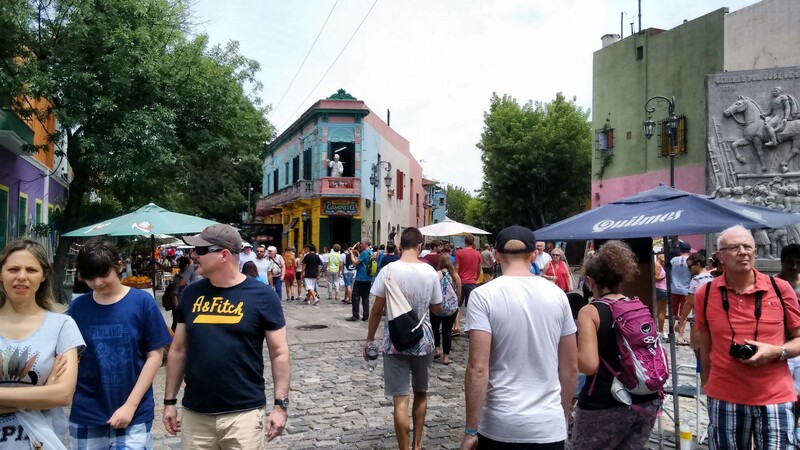 La Boca, or at least the bit that everyone goes to see, is only one street. El Caminito. You know, the bit with the multicoloured houses, and, yeah, the multicoloured houses. This lasts all of about five minutes. Five minutes of looking down an alley with many people trying to get money for pictures of them dressed as tango dancers or other things. 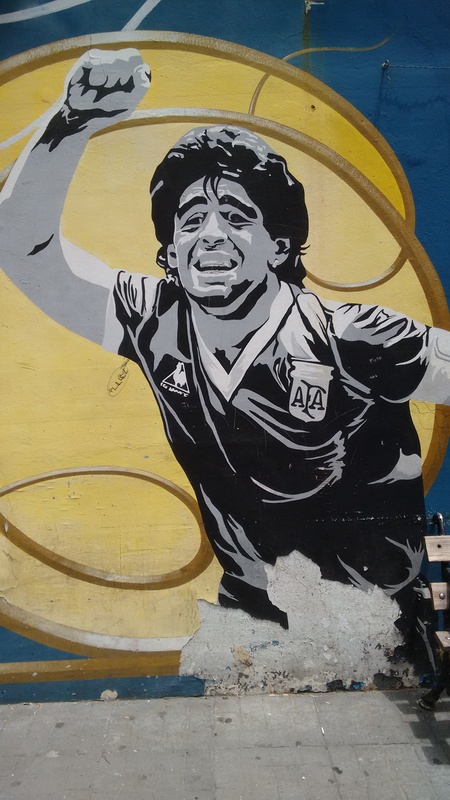 To be fair, you can even get your picture with Maradona here. Apparently, he’s been hanging around here every day for about 30 years now. There is more to La Boca though. 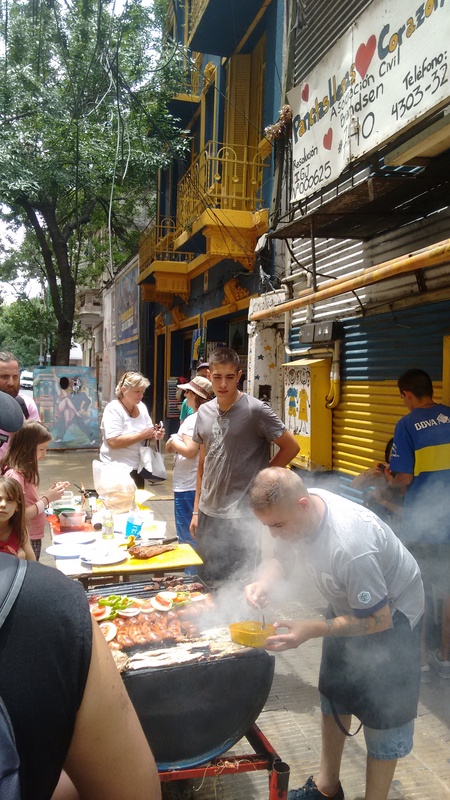 There’s the stadium, there’s tasty choripan, and, er, more pictures of Diego. Everywhere. After seeing Diego once more, this time getting a bite to eat at a local restaurant, most of the group split off, leaving only a few of us to traipse through the older San Telmo and Monserrat (where yellow fever and other epidemics forced the rich to Recoleta and the poor to move in) to Puerto Madero, the newest section of BA, built on reclaimed land. It’s less interesting here, more new skyscrapers and wide empty roads than old BA’s faux renassiance mongrel architecture, but we got talking to Danielle and George, two British girls. They’d just arrived from the remote south, and while directional sense didn’t turn out to be a forte, it was great to chat about their time in Patagonia. 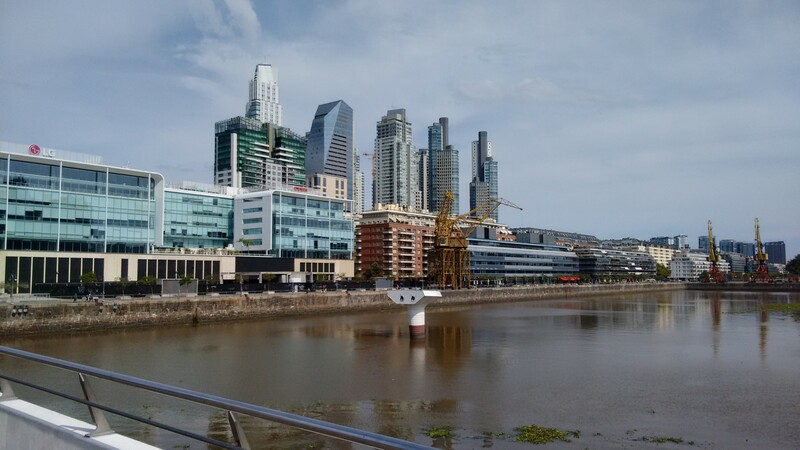 Puerto Madero, or every other big city near a river? We agreed to meet up later in the evening to go to a tango place that the guide had recommended. It didn’t start well. A lack of sufficient quality organisation on my part ruined the initial meeting plans (which had included picking up bargain 50 peso (£2.50) pizza along the way) so when we finally resolved the issue it was pretty late. 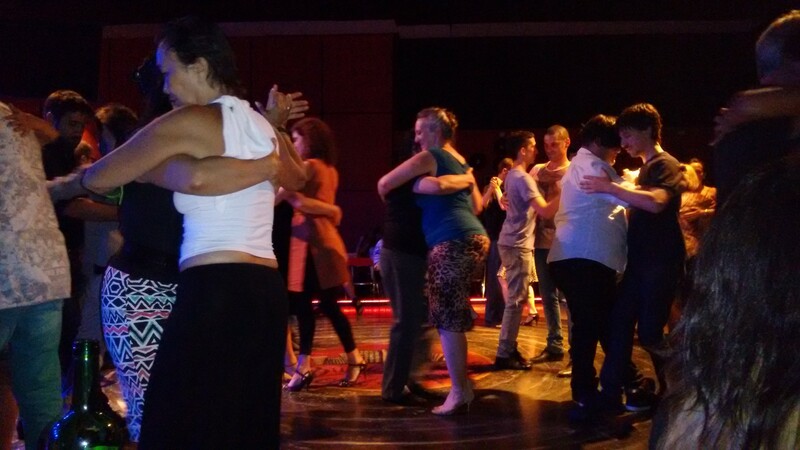 Nevertheless, we made our way to the tango, which was a milonga – more participation than just watching – only having missed the lesson. This was good, if not helpful for participation. On the flip side, it turned out that it was gay night – an already awkward dancing situation made just a little bit more awkward. Maybe it was good that we didn’t know how to dance. I’ll just watch at the moment, thanks. The night was spent just watching, though we vowed to return the next day for the lesson, in addition to the show that they would have. And we did. Our meet up going a little more smoothly this time, George, Danielle, TJ, another bloke who I don’t remember his name, and I arrived in time for the lesson. There were a few foreigners this time, as opposed to the previous night’s room of only Portenos, and our taskmaster teacher demonstrated different steps before getting us to attempt the same. Each time a song stopped we were required to change partners, so by the end I had danced with people who had a fair idea of what they were doing in addition to the possibility of some who even I was better than. Ok, so not many. The dance floor looks like a record, too. 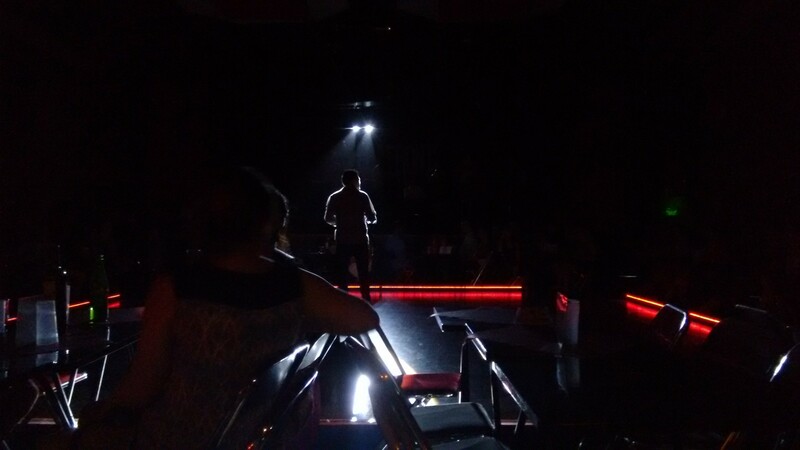 It was pretty fun, much more so than just watching at least, though I wasn’t very good at the strict, intenseness of the tango, and had a habit of talking at the same time. Apparently this is not allowed. I did survive however, and after it finished we retired to our table to let the more able dancers do their thing, only occasionally braving the centre ourselves. 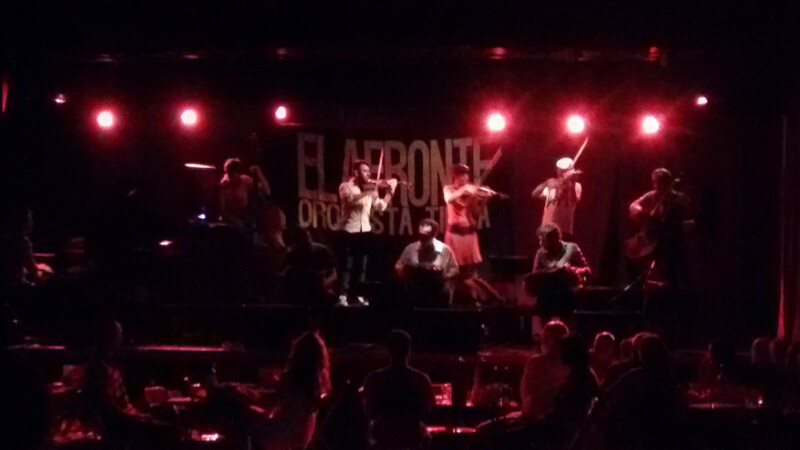 Part way through, a live band came out and started playing some really different tango music, and we could see why everbody seemed to like this place – it wasn’t like a rehearsed show – just a small, dark and dirty tango hall. They’re really going for the dramatic look. Before we left, a (possibly) professional couple came out to do a bit of a show. It was only short, but we’d paid next to nothing to enter, and felt that this was a far more unique place than the tourist shows. 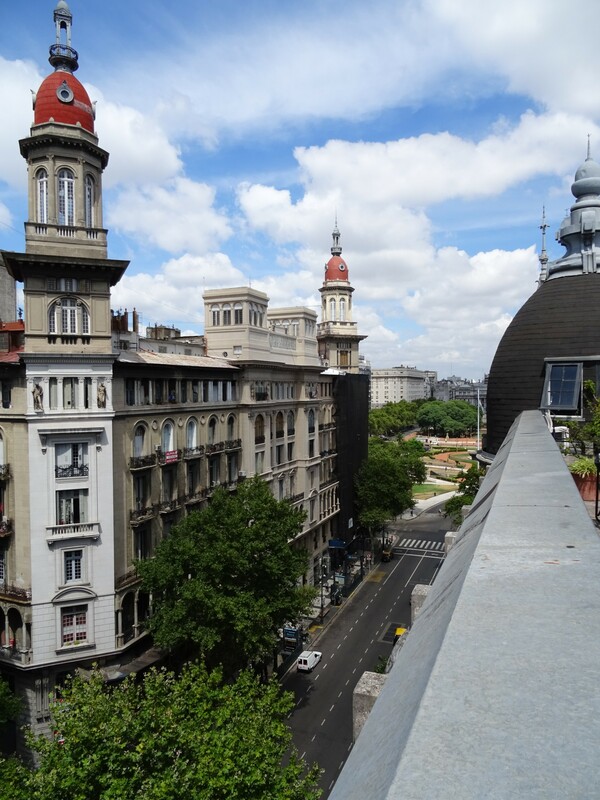 After finally getting around to the morning walking tour around the more upmarket Retiro and Recoleta districts, and exploring the famous cemetery there, I tried to formulate some sort of plan for my last couple of days. 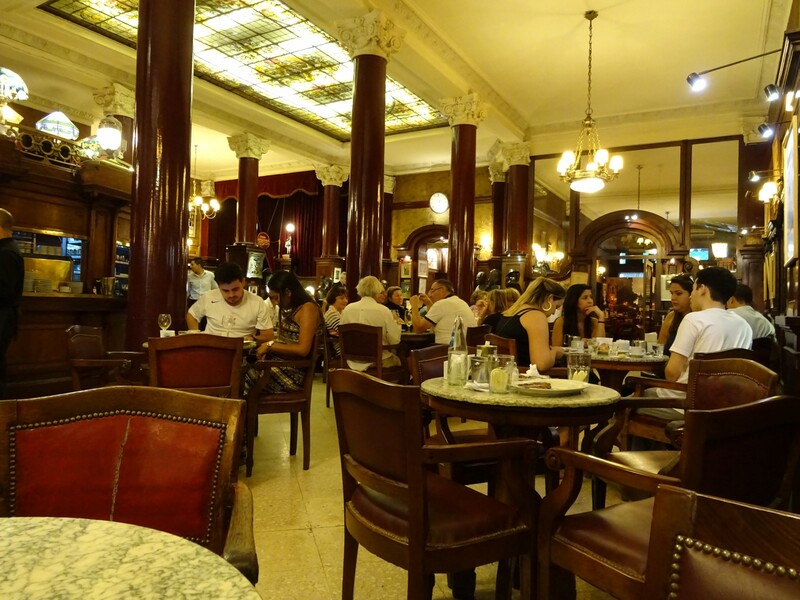 I wanted to check out Palermo, for sure, with all its restaurants and parks, and go to a museum in San Telmo, and have coffee at a famous cafe I’d been told about and do a whole host of other things. This went about as well as the rest of my plans do. Not terribly well. Looks like he’s got the weight of the world on his shoulders. Or maybe just a tree branch. I did visit the cafe. I managed that. 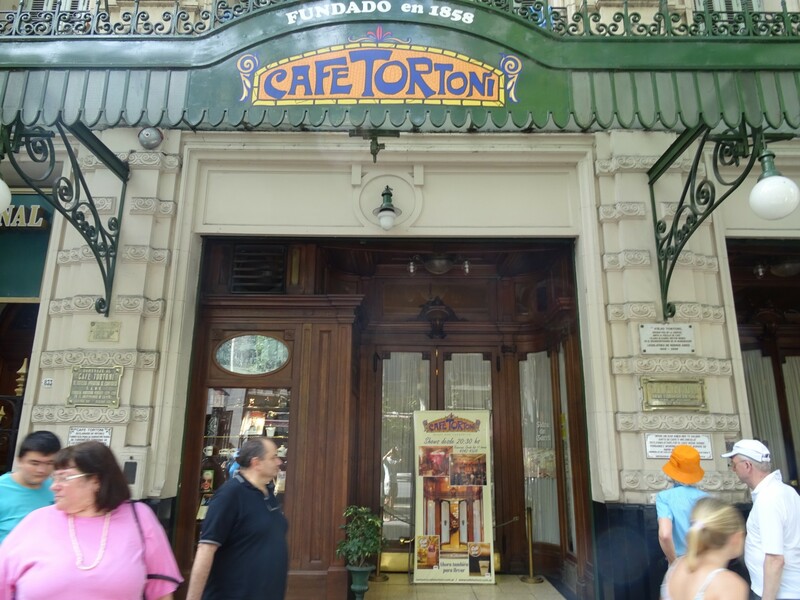 Cafe Tortoni, said to be one of the oldest and most traditional in Buenos Aires, actually has a queue to get in during busy periods. The doorman waits outside, occasionally bobbing his head through the doors to check what’s going on. If noone has left then tables are going to be miraculously free, right? Not that when people came out you could go in – they’re are some more delays involved of unknown origin. Meanwhile, the crowd spills out across the pavement of one of BA’s busiest pedestrian roads. Organisation didn’t appear to be top of the list here. Everyone just waits outside in a mess. No line, nothing. The cafe was nice when I got in though. Decked out like some bygone era, all qooden panelling, dark pillars and giant mirrors, everyone is busy chatting away. As I’d been advised, I stuck to coffee and didn’t go in for the expensive food – apparently BA custom being that you can stay as long as you like with one coffee. 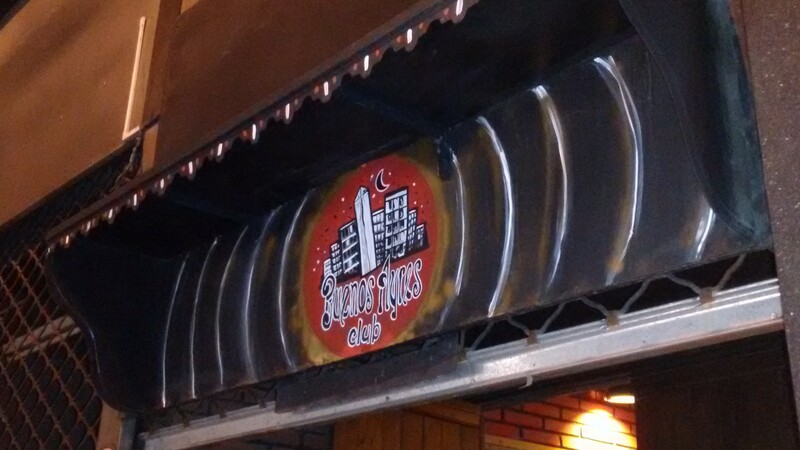 I didn’t stay to test this out, but it was nice to go in and see what all the fuss was about. 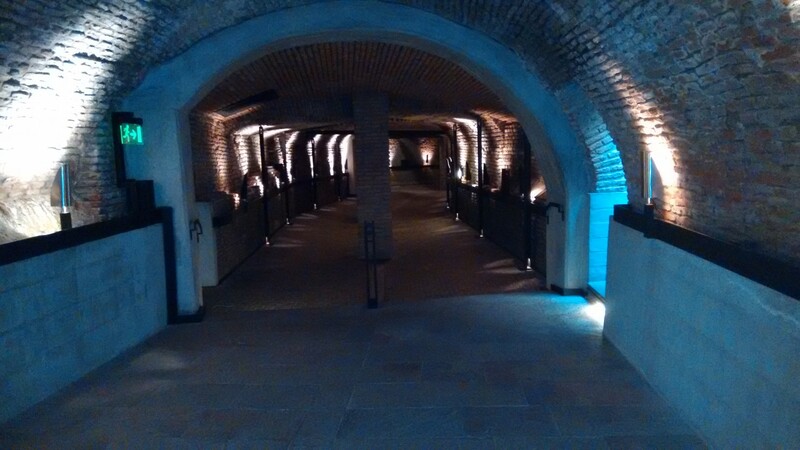 I also went back to San Telmo to go to the museum, El Zanjon de Granados, all about the tunnels under the old communal housing in the district. Apparently, a river used to run through the base of the houses and to keep it clean people were told they had to cover it. This meant each section has a different style of roofing based one the then house owner’s abilities. At some point the river was diverted, and eventually the tunnels were almost forgotten by everyone. I hope they don’t redirect the river. I never made it to Palermo though. I tried to fit it in, but other things got in the way – more drinking at the hostel probably being the primary one. Before I knew it, it was time to leave. I’d debated flying straight to Ushuaia as it’s cheaper than the bus (and shorter), but hostels were fully booked about 10 days in advance when I checked. I also tried to see if I could stay a couple of days at Sierra de la Ventana, but again, accomodation prices were firmly out of reach. The decision was made for me then. I would go straight to Puerto Madryn, in the middle of the Patagonian desert. 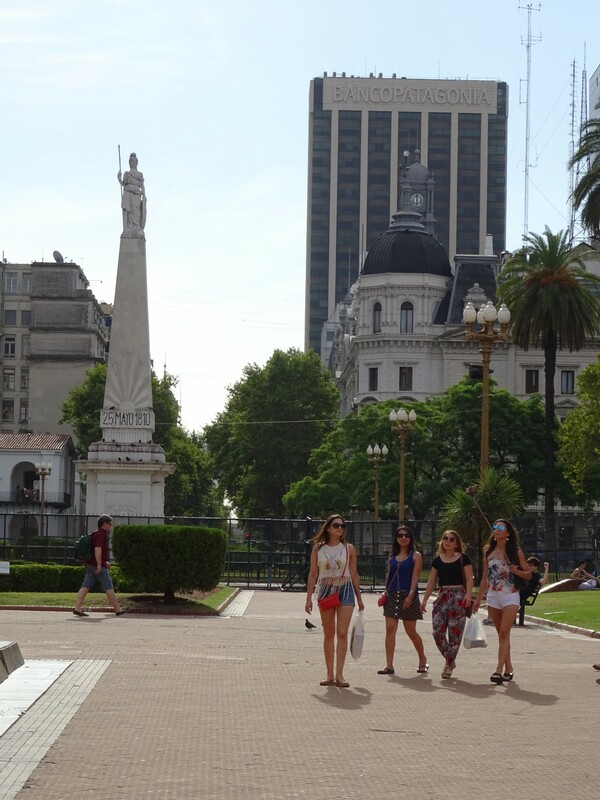 Cemetery Visit, City Exploration, Dancing, Football, January 2016, Money Issues, Tasty Food. Bookmark. Enjoyed reading this one Doug as you obviously enjoyed your self there and it came through in your writing. Butch read it with me rubbing his head against me and trying to walk over the key board. I guess someone’s got to edit the work, right?